LOS ANGELES - It's an early Sunday morning, way before the political talk shows even start and Chris Matthews is at it live, jabbering at a speed that would indicate a caffeine mainline that started hours earlier. For the bleary-eyed TV critics scowling while trying to focus on individual words as they speed by, it's a real effort to make sense of it. But at the moment he seems to be outlining his equally speedy TV delivery on shows like his signature "Hardball With Chris Matthews" (MSNBC, 7 and 11 p.m.). "Television, short questions, and let them finish," Matthews says. This jolts some who might have assumed that interruption was his trademark. Statistics show his guests have said "let me finish" more than 130 times since the show started on sister station CNBC in 1997. In May 2003, Republican pollster Frank Luntz said it three times consecutively: "Let me finish. Let me finish. Let me just finish." So, it was hard to believe Matthews was listing "let them finish" as one of his trademarks. "Unless they're Bogarting it," he said, quickly adding: "Sixties term." "And I think if I get them jumpy enough, they'll answer fast because they're afraid I'll interrupt them. That would be the idea." It's a frantic style that's been easy to parody, particularly on "Saturday Night Live," where Matthews has been the subject of a sketch more than a dozen times since 2000. "I do think Darrell Hammond does a great job of me," he says of the "SNL" impressionist, whose version of Matthews is even more wigged-out than the original. "I keep saying, `If he's as good at me as he is at those other guys, that's me.'" 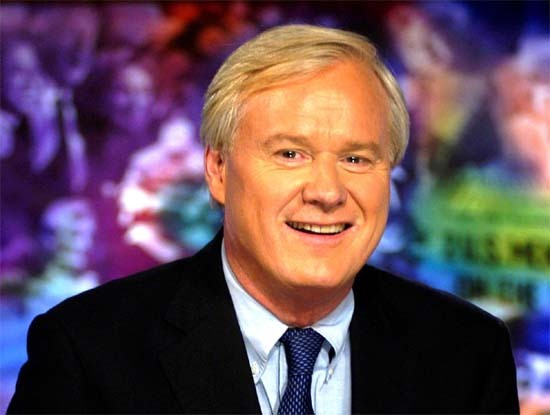 Sunday mornings, the pace is slightly slower on the syndicated "The Chris Matthews Show" (seen locally on WVIT, Channel 30), but he still can't hide his temperament. "I'm excited," he says. "And if I'm not excited about a topic and passionate about it, why should anybody watch me? I'm not an announcer. I'm not even an anchorman in the sense of, you know, here's the news straight. I care about these topics." Nevertheless, he's stung at being frequently dismissed as a loudmouth. "It's kind of like an ethnic slur," he says. "You know, the old thing if you're Irish, you're glib; you're not really smart. You know? I guess that bugs me." That and being called a talking head. "What part of our body are you supposed to talk out of?" he says with typical exasperation. "I'm sorry. That's what I do." Besides his own show, Matthews appears today on "The Tonight Show With Jay Leno" (NBC, 11:35 p.m.) with Sharon Stone and Brandy.